LDG’s popular Z-100 economy tuner is now the Z-100Plus. 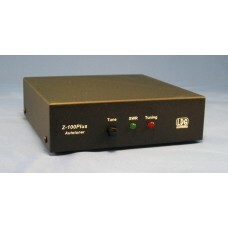 Still small and simple to use, the Z-100Plus sports 2000 memories that store both frequency and tuning parameters. RF Power: 0.1 to 125 watts SSB, CW and digital modes. 7 to 18 Volts DC, 100 mA. 3 foot DC power cable included. Includes 1 foot Icom and Yaesu 857/897 interface cable and 1 foot coax jumper.